A versatile high temperature coating, proven to achieve outstanding energy savings and refractory protection. 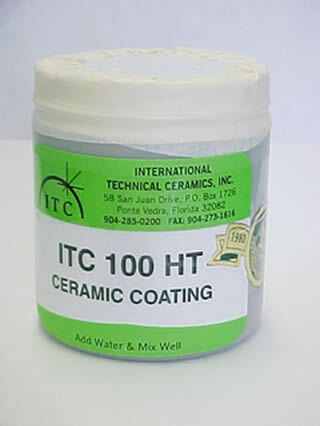 Use it alone and as a base coat for other ITC products. Applications include coating Kaowool, Inswool or other soft friable refractories including lightweight castable and insulating bricks to make a hard reflective surface. ITC-100 and 296A improves the IR reflectivity of all forge and furnace linings increasing efficiency and throughput. Stocked in pint jars. Gallon($500), and five gallon ($1900) buckets available by special order, please call. Directions: Remove all loose and weakened fiber and bricks, debris, particles, dust and grease from interior walls, door, crown, floor and grooves behind electrical elements. Immediately before applying ITC-100, dampen these areas by spraying lightly with water. For ITC-100, the manufacturer recommends to mix it 2:1, so if you have a pint, mix it with a half pint of water. Mix it thin, and apply the coats evenly. Applying several thin coats is better than applying a single thick coat. You'll likely have some left over for future patching. Spraying is the best method of application. For small applications a brush can be used. Dampen the surface you are applying it to, and dip the brush in water first each time. Coverage is 50 to 100 sq. ft. per gallon or 6 to 12 sq.ft per pint. While most refractory materials come in dry form, ITC-100 comes partially pre-mixed in a clay consistency. If your ITC-100 is starting to dry out you can store it in an air tight container if you like. Just add water to get it back to its original consistency.